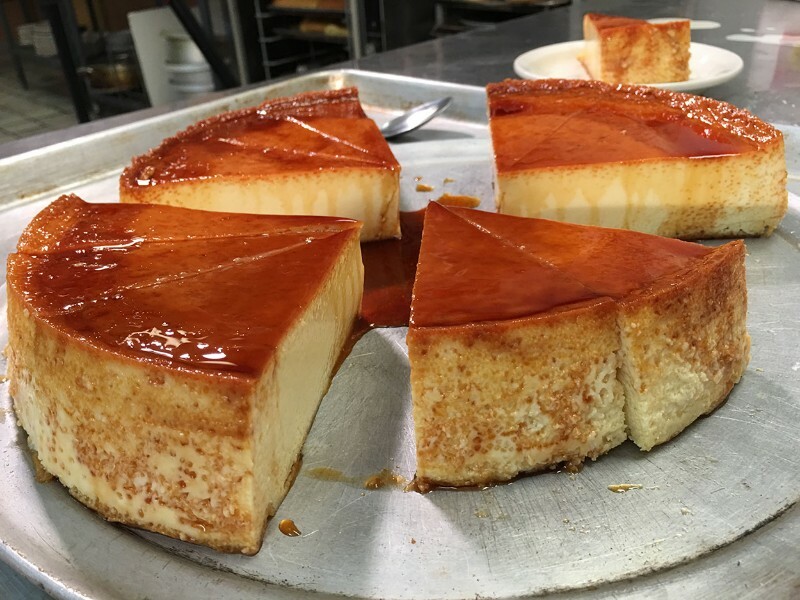 Owner Manuel Cias-Hernandez shows off his famous flan at the restaurant! Even though Cuba is 2,243 miles from Phoenix, Manuel Cias-Hernandez has kept the island close to his heart. “Cuba is a beautiful country. It’s surrounded by water with great beaches. It has wonderul food. I wanted to bring a piece of the island with me here. That’s why I opened the restaurant,” said Cias-Hernandez. HFNTV paid Cuban Foods Bakery and Restaurant a visit in the middle of August during an Arizona heat wave. But even temperatures around 110 degrees didn’t stop dozens of customers from streaming in all day. “We love it here. This is comida typica (Authentic Cuisine). It’s just like the Island,” said Juan Ramirez. see why he always has a smile on his face. “We came here more than 12 years ago as political refugees. We decided to stay in Arizona because we could find work easy here. We got here November 3, 2005. The tempature was 110. It was something new at the time,” said Cias-Hernandez. At 28 years old Manuel Cias-Hernandez and his wife Ana were political refugees. The pair had a young son, 100 dollars in their pocket and head full of dreams they wanted to make come true. hard to get great results and you can see the fruits of our labor now. It’s all worth it. In 2015 we became U.S. citizens and we are so proud, ” said Cias-Hernandez. As political refugees Manuel and Ana were given an apartment for six months in central Phoenix. The resturant would be named Cuban Foods Bakery and Restaurant. The restaurant opened with just six tables. Today there are more than a dozen tables and 52 chairs. When the restaurant opened it took a lot of work to convince the city of Phoenix that Cuban food was really good. “People said a Cuban restaurant here? People said okay let me try it. It was kind of slow. customers tell everyone that you ate here. To me that’s the best advertising that you can have. We make fresh pastries here. The food is made in more of a Caribbean style. We don’t use a lot of spices or hot chili like Mexican cuisine. A lot of my customers are Mexican and they love the food. It’s really good so once people try it out they really like it,” said Cias-Hernandez. You’ll love what’s on the menu! Side orders include Cuban classics like black beans and white rice, Papas fritas, Yuca con Mojo, Tostones and Moros Cristianos. Appetizers that’s you’ll love include: Papas Rellenas, Croquetas de Jamon and Empanadas de Carne just to mention a few. The Cuban sandwich is always a favorite. Pan con Bistec will leave you satisfied. You’ll love the Pollo a la Plancha is grilled chicken marinated in garlic and Lemon topped with grilled onions. yourself. CLICK THIS LINK TO TRY THEIR MENU. As for Manuel and Ana they continue to work to make their restaurant grow. He says when you try Cuban food you’re going to be a fan for life. “Once the people try it for the first time they love it. Because we do everything fresh. We try and do everything to bring customers in and make them happy,” said Cias-Hernandez. Customers are definitely happy you opened the only Cuban restaurant in Phoenix!